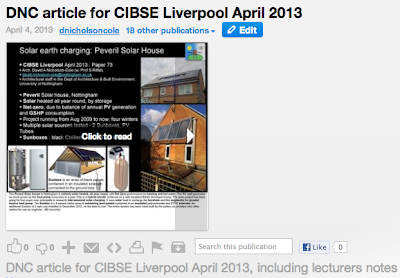 11 April 2013: I had the honour of being invited to submit another paper to CIBSE for this year's CIBSE Annual Technical Symposium in Liverpool, "Delivering buildings that are truly fit for purpose". Although I am an architect dropped into a bowl of high powered environmental engineers and Phd students, I really feel welcomed at the CIBSE events, and Professor Tim Dwyer epitomises the goodwill and hospitality of CIBSE. 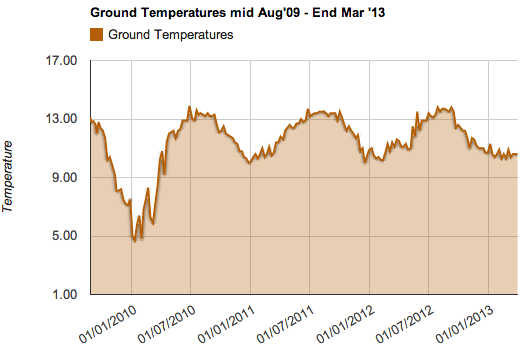 For CIBSE, I wrote up my thermal modelling project of 2012. Although the essential text of the paper was first written for the SET Vancouver conference of mid-2012, that was early days and there are enough changes to make a substantial improvement to the original paper and the powerpoint. There are an additional 8 months of weather patterns and meter readings since then, plus the additional Sunbox4 and the addition of ETFE to Sunbox3. It's interesting to see how the model has responded to the dreadfully long winter we have had, which only this week seems to be coming to an end. Im glad to say that the energy volume model image correctly reflects the weather pattern, more effectively than the temperature curve below which shows that the temperature is holding level, thankfully, not going below 10ºC, whereas the energy level has not yet begun to climb. The energy volume is low, not having had any real sunshine in 2013, and having had a continuation of the freezing temperatures, causing the GSHP to draw more energy. The volume is not as low as in the winter of 2009, and sunnier warmer weather is expected by the end of this week. One useful thing I learnt is that this sort of modelling is called Transient Modelling, a name that is still not explained in Wikipedia, but describes modelling where you follow a process by considering inputs and outputs at time intervals, and see what happens over time. This is how weather forecasts and climate change models are done. I my case I am using daily meter readings over 4 winters, with the time interval being one day, and this displays a clearer picture than just considering the Annual figures. The point of my model (and talk) is that you can continue putting thermal energy down there in the Summer but it still doesn't get 'hot' - there is always a good delta-T because the ground settles down to a comfortable temperature of just below 14ºC, and you can continue to deliver Sunbox energy to the borehole. What I deduce is that the energy volume increases, but the temperature does not, i.e. the volume of earth that achieves this temperature of 14º gets larger. I am not sure that I stated it as categorically as that - I fear not, and I need to edit the powerpoint to emphasise this. I also need to express the final Algorithm for calculating the Recharge Adjust Factor as a proper formula, not just as a line of programming code. I also need to be a bit more daring with that R.A.F. and see what happens if I vary it from 35 millionths. 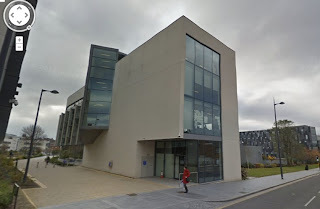 Rick Mather's Art and Design building for Liverpool John Moores University on Brownlow Hill (image off Google Streetview). An excellent place for a conference, also favoured by ArchiCAD Summer School. 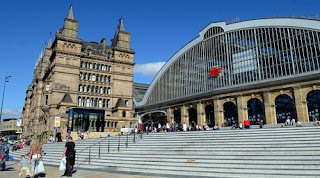 Lime St has been massively improved since I lived in Liverpool. 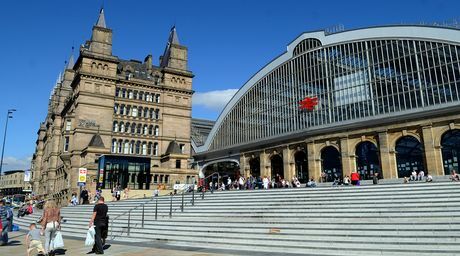 As you emerge from those arches and look over the city, the view of St Georges Hall and the city skyline is one that never fails to impress.